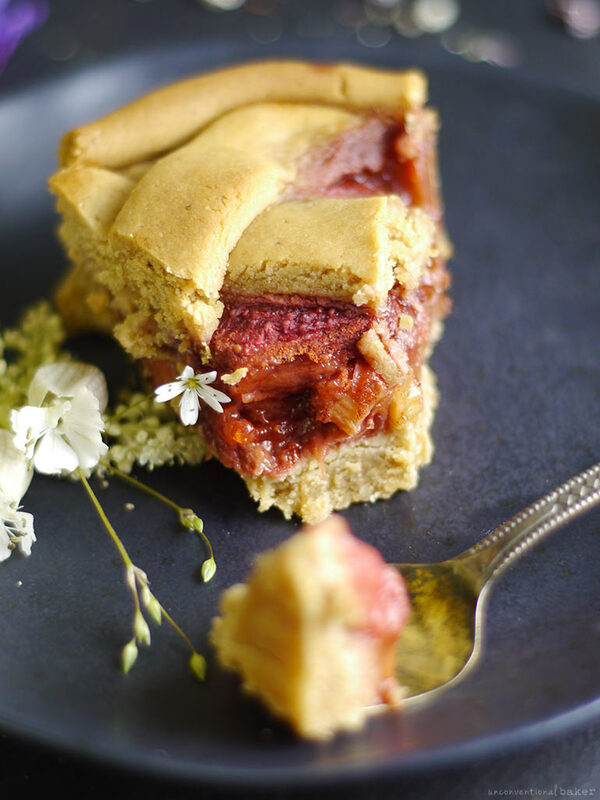 There’s something utterly satisfying about stepping outside to grab a fresh stalk of rhubarb and a pint of strawberries right from your garden and get baking. Fresh. Sweet. Tart. Red. Juicy. Beautiful. Fragrant. Easy. Classic. Canadian (sorry, had to slip that one in ?). Strawberry rhubarb pie is a rather satisfying summer tradition around these parts, and one that I’m always more than happy to partake in. 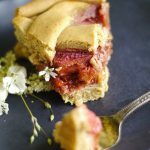 Celebrating summer with a strawberry rhubarb pie is a treat that I’ll never tire of. This year I tried it with lime instead of lemon juice and absolutely LOVED it. I think strawberries and lime make such a lovely duo, don’t you think? I already learned it via this cake, but somehow in the pie it’s a completely different experience. So reporting here with a quick and easy version I made the other day. 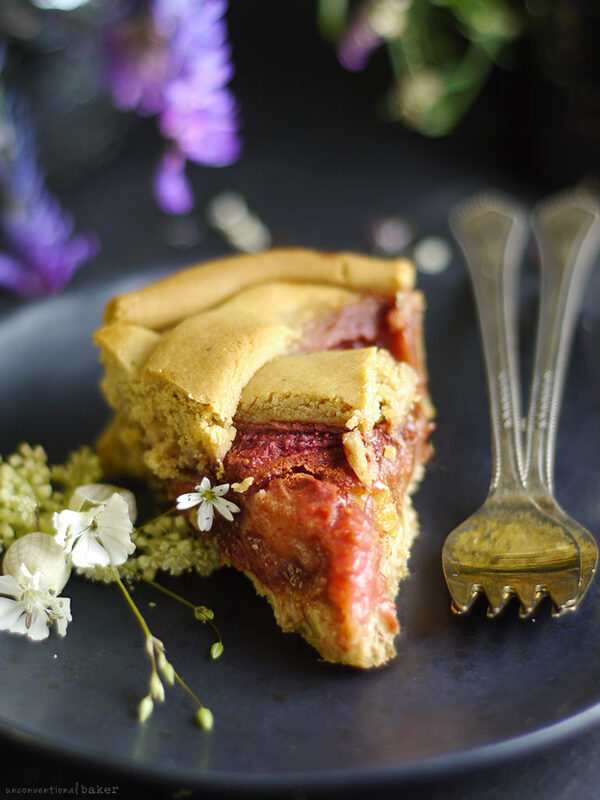 Of course you don’t need your own rhubarb plant or strawberry patch to join in — that’s just a lucky bonus for me; the pie is delightful no matter where you source your fruit. I’m really grateful to the previous owners who must have loved their rhubarb though — the plants they put into place yield the most delicious stalks for us each year. Likewise between the abundance of wild strawberries and the strawberry plants I put into the garden, I’m supplied with a good yearly quota of my favorite berry (that is if I beat the bunnies and bears to them ?). Lucky for me these two goodies come in abundance since I live far north enough that not much else that is perennial grows well here. Experiencing first hand the nature of growing food in a cold climate, it suddenly dawned on me just why this classic is considered Canadian — strawberries and rhubarb feel right at home; no tending required — they just love it up here and are happy to do their thing. Now back to the crust in this recipe (or if you’re going with sunbutter), make sure the crust dough is very soft — not too sticky to handle, but very soft and pliable. If it seems too dry or cracks as you try to work with it, return it back to the food processor and add a bit more maple syrup or cashew butter and process again until you have the right texture. You usually know the dough is at a good consistency when it forms a ball in the food processor. 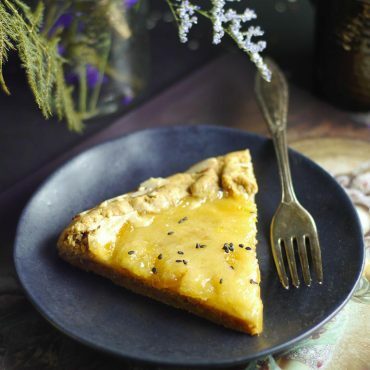 And… if you prefer not to bother with the lattice top, feel free to skip (though it is arguably one of the most delicious parts — it turns into a delicious, lightly crispy shortbread-like topping which complements the filling quite well). 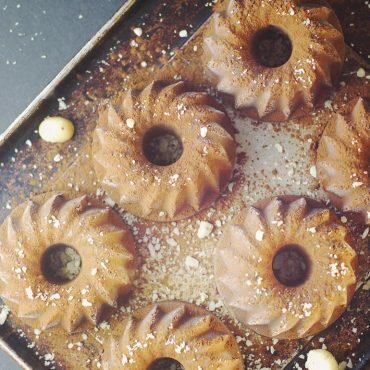 If you’re not comfortable working with a lattice but still want the topping, just roll out the dough, use a small cookie cutter to cut out little patterns (hello American friends…cute little stars for the 4th of July??) 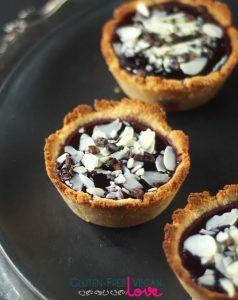 and decorate the top with them — I like to use my leaf cookie cutter for that to create beautiful edging on pies. Final note: I also made this in my mini 6″ pie plate. If you don’t have a dish that small, use any other oven safe dish of a similar size, or make a few tarts instead in a muffin pan or ramekins. Otherwise, triple the recipe for a 9″ plate. 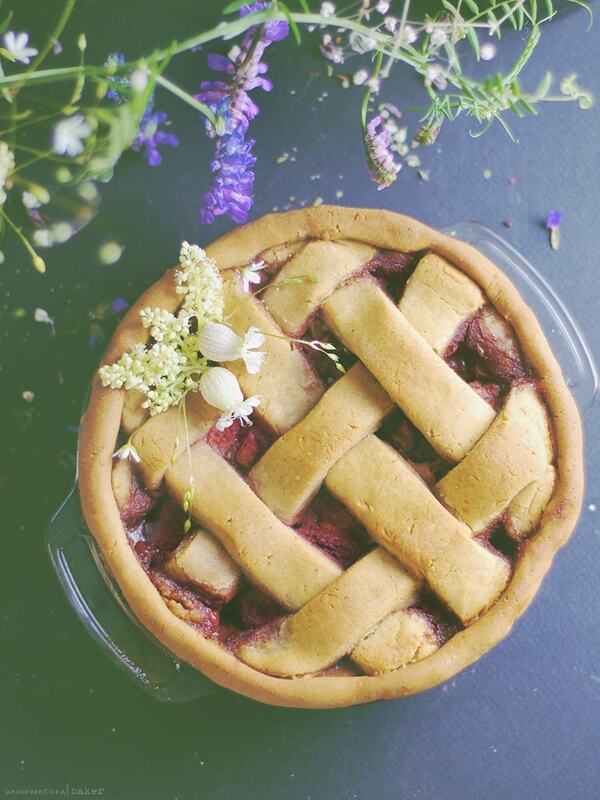 Sweet, tart, and juicy vegan pie made with strawberries and rhubarb. Gluten-free crust that’s totally simple to make — a summertime classic! Preheat oven to 350F. Oil a 6″ pie plate (or see notes above for alternative dish sizes). Set aside. Process all base crust ingredients in a food processor until the mixture begins to form a ball (note if the mixture is too runny, add a bit more flour, if too dry, add a bit more maple syrup, since the consistency may vary depending on the cashew butter’s consistency). Form the mixture into a ball with your hands and knead briefly, then flatten into a disk with your hands (if making a larger pie, you can roll the disk out with a rolling pin between two sheets of parchment). Place the dough disk inside the pie dish and form into a crust along the base and walls with your hands. Set aside. Combine all pie filling ingredients together in a bowl. Transfer into the prepared pie crust and flatten to fit inside the crust with a tiny bit of room at the top (for the lattice). Note what the liquid in the filling may rise to the top a bit while you’re working on the next step, and that’s ok. Set the pie aside. Process all lattice crust ingredients in the same way as in step 2. Note: super important that the dough is very soft and pliable, otherwise it will crack when you try to form the lattice — see notes above for correct consistency. Put the disk in between two sheets of parchment paper and roll out into a 1/8 of an inch thick circle. Cut into strips and then use them to form a lattice on top of the pie, criss-crossing the strips. Trip the edges. optional: I formed mine into a long “pipe” and wrapped it around the top edge of the pie and then sealed the lattice in. Bake in a pre-heated oven for 45 mins. Cool completely on a rack and enjoy! Disclaimer: this post contains an affiliate link to the pie plate I used. Ah, no worries at all :) I do use agave once in a while when I don’t have access to maple or if I want to avoid the maple flavor for some reason. I know it has a bad reputation online, but I personally go with how things make me feel as a priority — good quality agave doesn’t make me feel sick like sugar does, nor does it have the same effect on me as corn syrup (which is what a lot of people compare it to). But I agree — maple is much healthier and tastes great too. And brown rice syrup or coconut nectar, yacon syrup, etc. can be great alternatives as well. Thanks :) You know, I also enjoyed just the filling on its own btw. You can just bake it in a dish without the crust — sooo delicious with a spoon! Hi Janine :) I use like rhubarb because it’s a perennial — once you plant it, it keeps coming back each year with zero care on my part. But it’s definitely best with something like strawberries or raspberries. Why do you think maple syrup is not healthy? It’s higher in minerals and is quite pure in terms of how its processed. Plus it doesn’t make me feel sick and tastes delicious :) It’s also much easier for me to find. Rice syrup would definitely work here, but I don’t love using it because it’s not as sweet so you have to use more of it and also it makes pastries like this very crispy / crunchy. 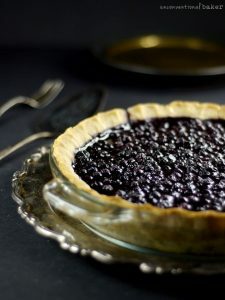 This has all the classic summertime pie vibes, so much so that I can’t help but want to plop a scoop of ice cream on top! Your lattice skills are quite impressive too, such a simple crust recipe but it lattices and browns perfectly. I think cashew butter is one of my favorite for using in recipes too :) I must admit I have a little bit of garden envy, fresh strawberries are the best. But yes it is usually a race with the critters for them here too! Thanks :) Summer vibes caught me on my way to pick rhubarb, so grabbed some of the rhubarb flowers and a few stray weeds on the way back for decoration. 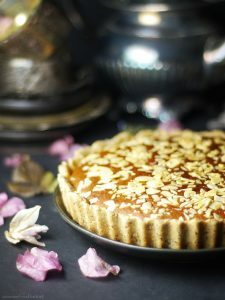 I had it with a light coconut whip and it was delicious, so I can imagine it would be amazing with ice cream, but it didn’t last long enough around for me to give that a go ? And so much yes on cashew butter — it’s hands down my favorite nut butter EVER. Speaking of critters, one dug up all my celery plants today and just left them uneaten all over the garden — all I could think was vandalism! ? 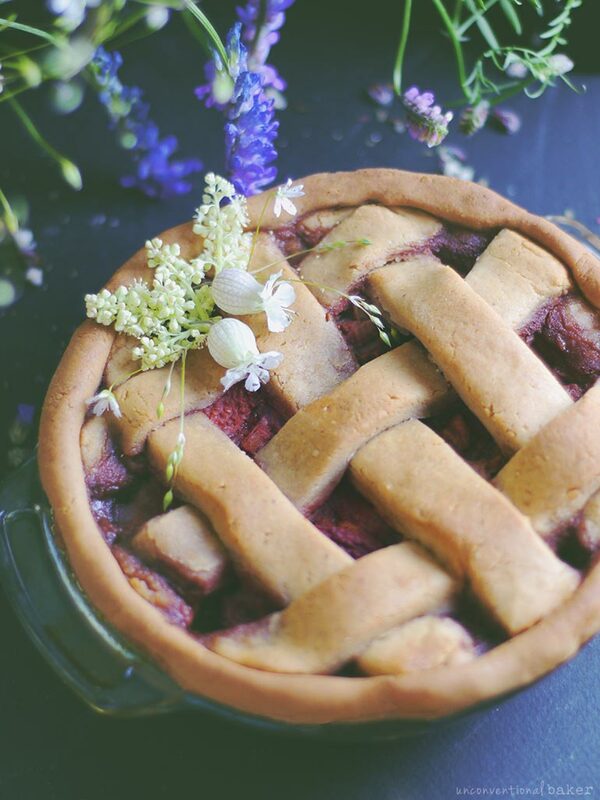 What a beautiful pie and perfect for summer time – I love the lime twist! Thanks Kari :) Lime really freshens it up. Yes, I know what you mean — I quite like the consistency of this crust. With the gf crusts I think my bigger woe is not so much crumbly but crunchy… This one was just right.